There is a world of difference between the Kathmandu portrayed in much of the international news media and the Kathmandu I see in the few hours I venture out everyday from my earthquake-proof flat in the southern outskirts of the city. I am certainly not the first to note this; others have rapidly come to the same conclusion, holding that while the April earthquake was indeed a huge disaster, the images of widespread, uniform destruction all over were not representative of life on the ground. In the capital there is perhaps more stark a contrast than elsewhere. Many buildings, several on each street I would guess, have been destroyed or seriously damaged. Others, the majority, appear undamaged. A friend showed me around Tudikhel, a large grassy recreation ground in the centre of the city, clambering over piles of red bricks lying on the pavement with little comment. Some of them had been placed across deep puddles for people to step across. Walking into the park through a space until recently occupied by the large metal gates that now lie as scrap at the entrance, I saw several tents of the new homeless. A few tents carried the stamp of their sponsor, China. I asked him if the people were instructed to gather here. “No, not really. It was the obvious place to go,” he said. In a built-up city, that made sense. As we looked around, a policeman came over to ask us our business, then satisfied with our explanation, returned to his small group of colleagues assigned to the area. There is a degree of normalisation following the destruction. Across the country, some remote areas still lay devastated, while much of the nation, away from the epicentres, remains largely unaffected. This isn’t to say things aren’t bad. They are awful for many thousands of people—those who have lost their husbands, their wives, their children, their homes, their workplaces, their sustenance. Nearly 9,000 people died, some 600,000 houses were destroyed, and more than 288,000 damaged—and that’s only what has been confirmed. But it is of concern that our media—for myriad reasons—has often reduced the country to rubble, first through 10 years of conflict in the civil war and now through a natural crisis. It defines Nepal as a place of perpetual disaster, of constant peril, a nation of victims. Were it not for the piles of debris, or the concrete columns reaching into the sky with nothing to support, or the evening symphony of drilling and hammering and sawing as people make to repair, or simply strengthen, their abodes, you might not know that there had been a disaster at all. Life, as they say, goes on. That isn’t because of some sort of noble work ethic, or an innate resilience of a proud people. There can be something quite patronising about the talk of ‘resilience’ in the face of a disaster in the developing world. That’s not to say it is not true. But it is often said by Western commentators in such a way as to suggest that there is some sort of choice about it, or that somehow the tragedies of nature and humanity are not felt as such a problem in the exotic corners of the world we only hear about following the latest war, famine or earthquake with visuals exciting enough to promote them to lead item on the evening news bulletins. There is a level of resilience in Nepal, but there has to be. One story relayed to me was that of a woman who lost her children and husband in the earthquake. She had called for them all to leave their house, and had the grim fortune to be the first out of the door when the building collapsed, entombing her family. Several weeks after this, she was found digging through the remains, trying to gather grains of rice from the wreckage. That is not wilful resilience; that is the necessity of survival. Poverty was the main cause of suffering after the earthquake. There is of course a general concern that permeates all sections of society. But the poor—as is so often the case—suffer the most. More than 40 per cent of the houses in Nepal are made with mud and bricks, according to the 2011 census, and easily destroyed in earthquakes. Now many thousands wait for government compensation, NPR 15,000 (around $150). Many of those my colleagues and I spoke to are still waiting for this under their zinc shelters. Some are afraid to begin rebuilding their houses until government inspectors note down the damage; others have no means of identification that is needed to claim their money; yet others simply do not know how to begin the bureaucratic process. 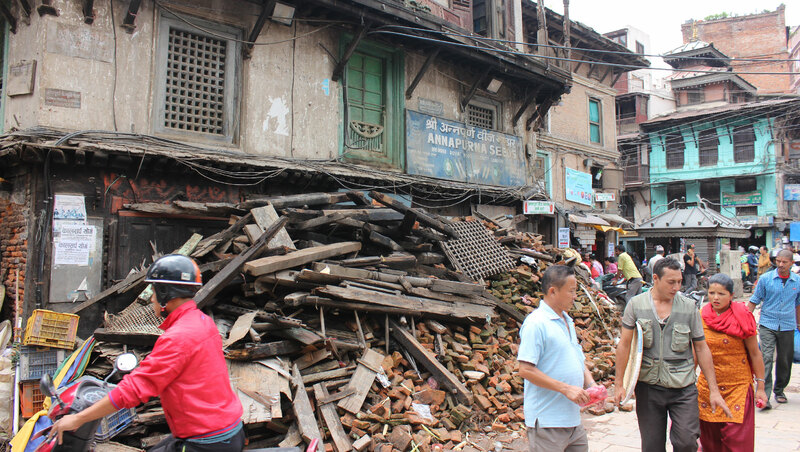 Some Nepalis are also said to have rejoiced at the loss of their homes. Their former dwellings were in such poor shape that the chance to rebuild with government funds essentially allows them an upgrade. One friend told me that there were celebrations in her area for just this reason. Another big concern has been the monsoon season, which led to numerous landslides across the country, the result of earth loosened in the quake. This means that buildings are still at risk of demolition, families at risk of burial. Already, 90 people have been killed. But when it comes to reporting from these places, it also brings the issue of access. As we plot our various trips around the country to get a firsthand view of the situation, some areas are simply no-go, as buses are diverted and highways closed. A trip in a helicopter is unfortunately beyond our means, as it is for the majority of aid workers. Then there is the question of the winter. The shelters I have seen might just serve their purpose in the heat, but their occupants would surely struggle in temperatures as low as 5 degrees, the average for January in some areas. And the aftershocks continue. Barely a day passes without a brief shake of one or two seconds, which hardly registers with many by this point. The more cautious may evacuate to the street, others may pause their business meetings, and at night most will simply sleep through them (including myself, apparently several times). I experienced my first aftershock as I was about to conduct an interview. I noticed the door of a bookshelf rattle slightly. My host quickly beckoned her colleagues and myself to evacuate the building. As we stood outside, someone hurriedly deactivated the power generator, and within moments the mild panic turned to good humour, and the working day resumed. The same could not be said for the primary school children, elsewhere in the city, who ran from their building crying, as one colleague reported to me via WhatsApp. As I write this, Kathmandu is embraced by an electrical storm, its thunder strong enough to make the glass of water on my table tremble. I wonder to myself how many infants will wake up tonight, themselves trembling, terrified that it is something worse. There is also the fear about the future. Seismologists have predicted the spring earthquake was not ‘the big one’ that will release the full extent of the subterranean pressure that has been building up for centuries. The invisible turmoil beneath our feet, which over an age built up the Himalayan mountain range, is yet to entirely articulate its rage. But by this point the panic seems to have dissipated. What else could it do? Aside from all this there are the everyday inconveniences. The hot water supply where I stay was damaged, meaning cold showers for a few weeks as the maintenance workers fixed their way through the city. Patches of wall are void of plaster, and people keep note of newly appeared cracks in the masonry. Is that a supporting wall? Is the house safe? Should money be spent ensuring so? I say all this to return to my original point: we need an honest appraisal of the situation in Nepal. I do, of course, write all this from a position of privilege. I stay in a well-built apartment—on the first floor, no less, in a deliberate attempt, as per risk assessments, to mitigate the perils should another quake strike. And this is but the tip of the iceberg. Should the unpredictable result of deep tectonic movements once more rock the former kingdom of the Himalayas, the worst problem I would face would be getting to the airport with my belongings. I might miss breakfast. But for a large section of Nepal’s population, life is now more precarious than ever. That does not need any exaggeration, and it should not be forgotten.